The image was great, as expected. However, there is a slight dent to the wood frame, which doesn't allow the canvas to be perfectly flat against the wall--not sure how to fix this issue! Command attention with this dramatic wall art. This print combines a stylized floral design with a black and white palette to create a clean, contemporary look. Dimensions 1.5 In. X 36.0 In. X 46.0 In. 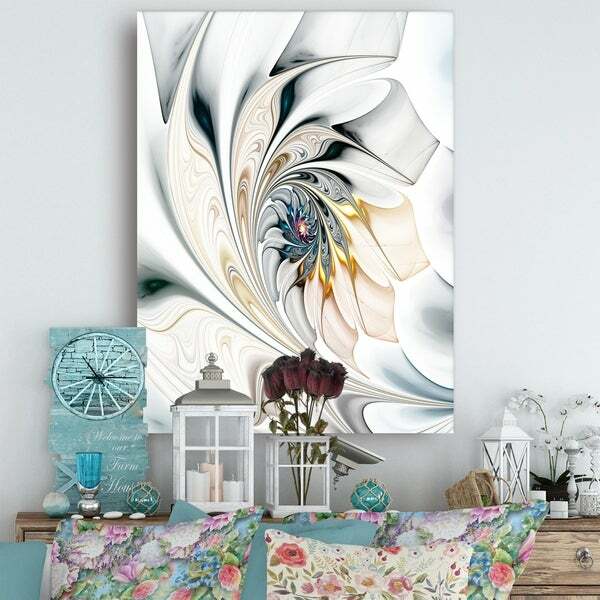 I love this item white stained glass wall art floral canvas it's exactly what I was hoping for. I waited to purchase this lovely art because I couldn't decide on the exact size. I made the correct choice in size and the white stained glass floral art canvas! How beautiful it fits in the room and match my decor perfectly. The room needed that special 'wow' and this was it. My husband and I love the detailed expensive look but the price was affordable and it arrived on time without damage. I wanted something different for my living room wall, besides the usual large framed mirror. This canvas print is beyond different. Ti is bold without being over stated. The colors are soothing and go perfectly with my sofa. I ordered 3 of the matching throw pillows, hoping to see the throw available soon. I highly recommend this print for anyone looking for something different and class! There are a lot of other designs to choose from but this is by far my favorite. I love it, price was under $100., arrived a day early, exactly as described, PERFECT! I really love how this Floral wall art compliments my dining room and adds an extra elegant decor to it. It was the perfect selection and it shipped really fast!! I purchased the 30x40 “ Stained Glassed “ canvas painting . The reason for the quotes is because your on line Description states that it is “ Stained Glass” that is what I expected to receive so as I was opening the box I was extremely excited to se my “ stained Glass canvas painting only to be somewhat disappointed to find that it was NOT “stained glass “ at all. I’ve yet to hang it as I ‘m not certain That I like it enough to keep it . I was eagerly anticipating receiving this wall art however I was disappointed to find that the detail in the photo is much more vivid and defined than the actual product I received. The background is bright white as is most of the design on the canvas. Returned this item as a result. Very meh. This is just a print on canvas with no embellishments or hand touches like some other prints you might see. Arrives well-packed with no damage. Not art you would use as a centerpiece/focus. I bought the wall art and the throw pillows and absolutely love them all. The pillows have an abundance of stuffing and always look amazing and the wall art is beautiful and eye catching. I have received lots of compliments on these items. You won't be disappointed with this purchase. I am very disappointed in the condition I received the White Stained Glass Floral Art canvas. The canvas was stretched across the wood frames and the wood was not put together. It was suppose to be ready to hang. I worked for over three hours putting it together and preparing it to hang. I have never received anything from Overstock.com in such bad condition. Not as pictured. Canvas quality Not that good. Fantastic really adds to my bedroom decor. this is a ultra modern canvas. we are really enjoying it in our home. I used it for staging a home that was forsale and got many kind words on it. I just received this today. It’s a absolutely beautiful piece of artwork. Very easy to hang and definitely a statement piece. I bought the largest size. I have it 4 stars because of the weight. For the price I paid I expected it to be “heavier” more durable if you will. It’s very VERY lightweight! It doesn’t have any gloss or shine to it which would’ve made it pop even more. Overall it’s a beautiful piece of artwork. The picture arrived on time and was nicely packaged so had no damage. We are pleased with it, it is nice quality. The colours are more vibrant than we expected so it really 'pops', it is not a 'background' picture. We are pleased with the purchase. Arrived in perfect condition and looks just like the picture does on line. Will fit beautifully on the wall in my entryway. I have already gotten lots of compliments on the dramatic effect it causes when I open my front door. Love it! This piece looks better in person. I actually put it my newly renovated bathroom, looks great. This picture is outstanding. Perfect for my dinning room. Love it, and I would highly recommend it. All my friends want one. We hung this artwork suspended from the ceiling against a cement full height fireplace. We used wires and ceiling bolts to drop down the art to the proper height. It looks great! I love this canvas photo. The color brings out the the other decor in my bedroom. The size of the picture was larger than I expected but fit perfectly above my bed. The picture is very elegant and looks very expensive. It was actually reasonably priced.. would recommend this product. Very unique, dresses up my small wall space. Beautiful! Exactly what I wanted for my office. This is a lovely piece of art. The colours are exactly like shown.Delivery was efficient and it was well packaged with all the essentials to hang it. I am quite pleased. Canvas is loose all around frame. Picture is not as vivid as it appears in photos. "do you have to put the picture together or is it already together"
No, you do not have to put it together. 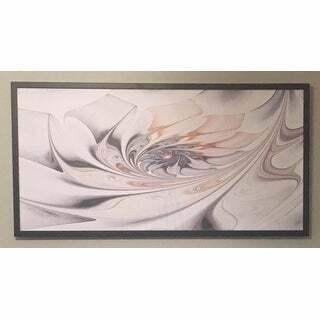 It is on a solid canvas, which you can hang vertical or horizontal, frame or hang as is. Either way is Beautiful! "Are the panels shown on either side of the canvas curtains? (not necessarily for windows) - are they available? If so, at what cost?" "Do you plan on more inventory of these pillows?" We expect these pillows to be in stock in approximately 30 days. "Do you have pillows to match"
Unfortunately the pillows are not available. "Do you have the matching throw pillows pictured in the White Stained Glass Floral Art?" "With reference to the 20 x 40 - which is the length and which is the height? With reference to the 16 x 32 - which is the length and which is the height?" This artwork is wider than it is tall. For examples 16 inches high x 32 inches wide. I am a graphic artist and this is what I enjoy looking at. It goes very well with my grey/blue walls, white window frames and accents, light wood white washed cabinets and vanilla yellow leather couches. My fireplace stone has all these shades in it also. The size had to be 30x40" and of portrait orientation. It should be perfect.